I hope everyone had a nice Christmas! I spent mine rather quietly at my childhood home eating a lot of traditional Finnish Christmas food and exchanging a few gifts. I will introduce one of them sometime soon when the weather gets a bit more tolerable. This outfit is from Sunday night, it’s sort of a tradition here to go out on the Boxing Day and shake off all the Christmas stress – dancing from 9pm to 4am definitely did that for me. Hence the relaxed outfit and comfortable shoes; you need those when you’re not sure how many drinks are going to be poured on you and how much glass there is on the dance floor. This time around I could avoid it all and had an amazing night to remember. Now my aching body remembers it too. Enjoy the last week of 2010! You we’re at the Club, too? Or at the Yo? I was at Yo. We were debating between the two of those but the nostalgia of Yo-talo won us over.. My friends and I have all spent our youth there, and the good old DJs were spinning, so the night was set. 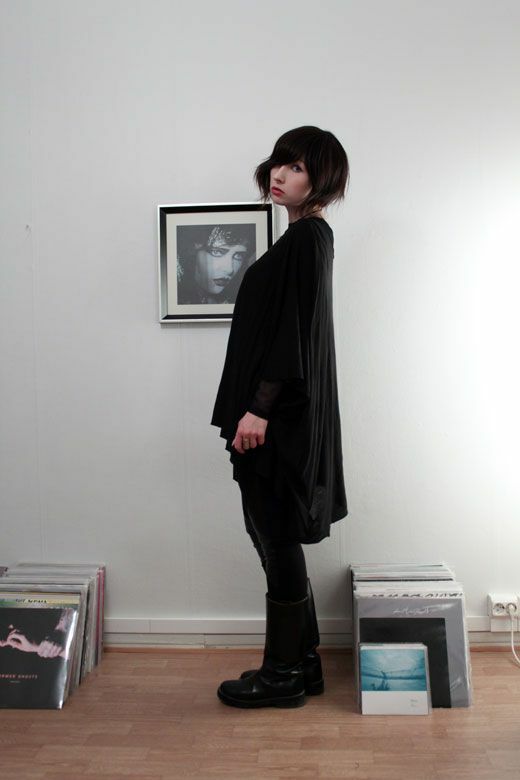 gorgeous look and not heavy or boring at all, even though it’s all black. Thank you. 🙂 To me black is never boring, I find the different shapes and the surfaces of the garments more interesting in all black. Ja ei haittaa. 🙂 Harmi, että olin itse sen verran väsynyt, etten jaksanut tulla enää jatkoille. Ens kerralla sitten! Hyvältä näyttää – kuten aina! “Laatikkomainen” päällyskerros laskeutuu todella kauniisti. Tarvitsisin itsekin tuollaiset huolettomat mustat saappaat, matalalla korolla. Ann D:n saappaat ovat olleet kyllä joka pennin veroiset; en enää uskaltautuisi Suomen talveen ilman niitä. Itselläni on tosin tällä hetkellä mittatilauksessa korolliset huolettomat saappaat, kunhan ne vaan valmistuisivat joku päivä…argh! I could guess that you approve. 😉 Thanks dear! I used to follow your blog like ages ago, but forgot about it for some reason… BUT LUCKILY I FOUND IT AGAIN. Yay. How come your english is so good btw? And are you still together with your (very gorgeous!!!!!!!!) boyfriend? He is foreign, right? Does he speak Finnish? Hej! Jag vill gärna tipsa om var jag brukar fynda märkesvaror på nätet. billigt, Just nu Odd molly och Vila. Don’t know so much about those brands but I guess you could check out Asos or Nelly.com for those. My blog is really not about these labels, so you might want to ask someone else. Great look! I love the red lips. Thanks! It’s my signature Lipstick from YSL. Still does the trick…. I love the all black. You rock it.